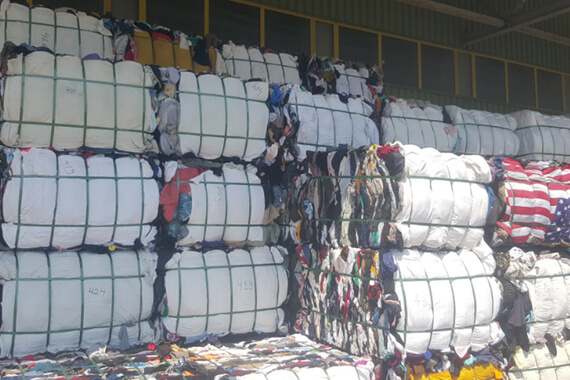 Textile waste – Da Trans Ltd.
With its constantly expanding portfolio of processed waste, in recent years “Da Trans” Ltd. has been successfully developing the service of management of processes connected with textile waste, waste from clothing factories and second-hand clothes. Textile waste comprises materials which are generated in the course of various activities in the textile industry or of the final users of these products. They include various sources of generating, such as the processing of textile fibres and fabrics, manufacture of clothes, waste from final users such as second-hand clothes, household textiles, etc. Scrap from factories for cutting and manufacturing clothes and other textile products is waste, generated during the process of production in factories, which is of two main types – sorted and mixed. Waste from second-hand clothes and household textiles is generated by the population in the course of the usual human activity. A part of the textile waste described above comprises raw materials fit for recycling, whereas the rest cannot be recycled and has to be disposed of. The Bulgarian legislation, harmonized with the European requirements, forbids the throwing away and depositing of waste of this kind on municipal waste sites. In that area, “Da Trans” offers its clients and future partners a comprehensive service including consulting, shipment, temporary storage and delivery for recycling or disposal of various kinds of textile waste. The professional, competent and responsible team of “Da Trans” Ltd., made up of expert ecologists, economists and specialists in logistics, guarantees its clients accurate and cost-effective solutions for the management of the processes of managing the flow of wast; solutions that are entirely compliant with the applicable laws.